Rashedi, H., Izadi, A., Esmaeili Bidhendi, M. (2015). Optimization of Operational Parameters in Rhamnolipid Production by Pseudomonas aeruginosa MM1011 in a Miniaturized Shaken Bioreactor. Journal of Applied Biotechnology Reports, 2(3), 271-278. Hamid Rashedi; Ali Izadi; Mehdi Esmaeili Bidhendi. "Optimization of Operational Parameters in Rhamnolipid Production by Pseudomonas aeruginosa MM1011 in a Miniaturized Shaken Bioreactor". 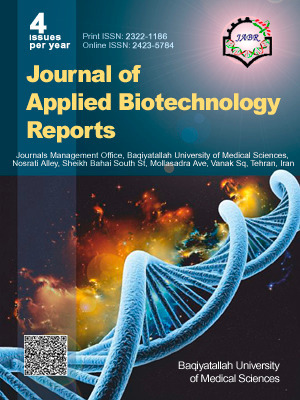 Journal of Applied Biotechnology Reports, 2, 3, 2015, 271-278. Rashedi, H., Izadi, A., Esmaeili Bidhendi, M. (2015). 'Optimization of Operational Parameters in Rhamnolipid Production by Pseudomonas aeruginosa MM1011 in a Miniaturized Shaken Bioreactor', Journal of Applied Biotechnology Reports, 2(3), pp. 271-278. Rashedi, H., Izadi, A., Esmaeili Bidhendi, M. Optimization of Operational Parameters in Rhamnolipid Production by Pseudomonas aeruginosa MM1011 in a Miniaturized Shaken Bioreactor. Journal of Applied Biotechnology Reports, 2015; 2(3): 271-278. A rhamnolipid–type biosurfactant production by Pseudomonas aeruginosa MM1011 was studied in a miniaturized shaken bioreactor. The operational parameters, affecting the biosurfactant production in shaken bioreactors, such as shaking frequency (200, 250, 300 rpm), filling volume (50, 75, 100 ml), and aeration rate (0.2, 0.6, 1 vvm), were optimized using response surface methodology. The optimization process conducted based on three different response variables (surface tension, rhamnolipid concentration, and emulsification activity). The best results were achieved at agitation rate of 292 rpm, filling volume of 50 ml, and aeration rate of 1 vvm. Also, the results indicated that all of the three factors were effective parameters in biosurfactant production and the surface tension, rhamnolipid production and emulsification activity under optimum conditions, were measured 31.00 mN/m, 1.89 g/L and 80.23 %, respectively.